Three men have been charged with 20 total firearms-related offences. Ralph John McCray, 56, Todd Elmer Trepanier, 47, and Gregory Michel Richard, 19, appeared in Miramichi provincial court Thursday. Police seized a prohibited gun magazine in the raid. 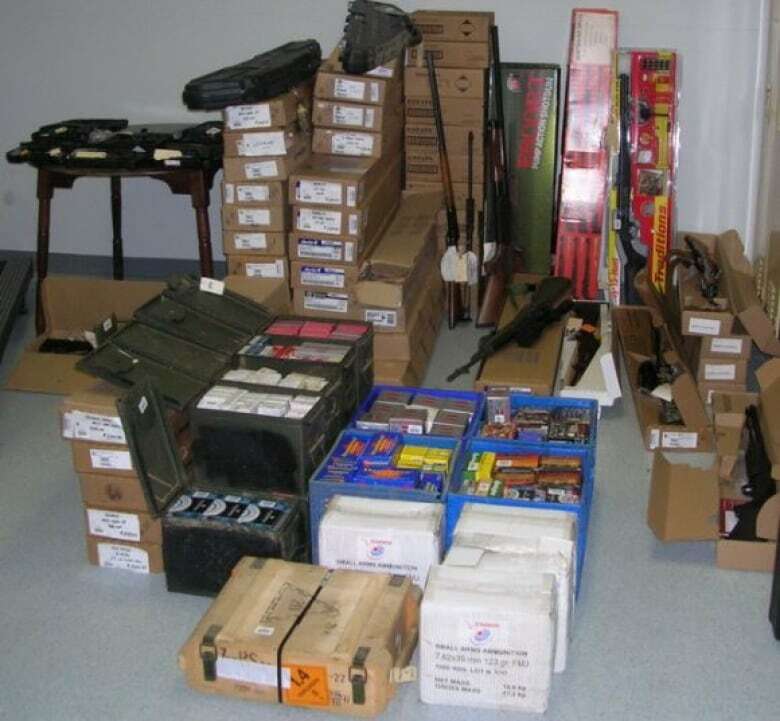 61 firearms and thousands of rounds of ammunition have been seized from Miramichi City Surplus (RCMP)Three men have been charged after a seven-week undercover operation in the Miramichi area. Ralph John McCray, 56, Todd Elmer Trepanier, 47, and Gregory Michel Richard, 19, appeared in Miramichi provincial court Thursday where they were charged with 20 firearm-related offences in total. 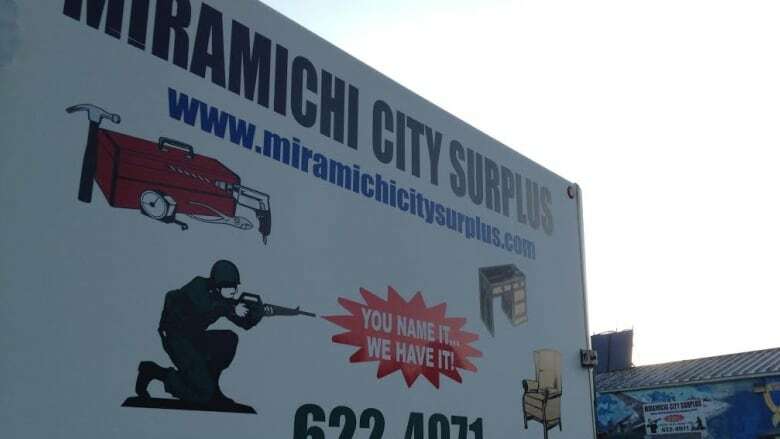 The raid occurred at Miramichi City Surplus. McCray is listed as a director of the business on the store's provincial corporate registration. According to RCMP Const. Eric Anderson of the Sunny Corner detachment, the remaining two men are employees there. "This stemmed from a separate investigation on an individual who was in possession of a prohibited firearm," said Anderson. "This is a concern to the police because of the potential of firearms getting into the hands of people with criminal records, including those who have been prohibited from possessing firearms," said an RCMP press release. McCray was charged with six offences, Trepanier with four, and Richard with 10. All of the charges are related to the unlawful or unauthorized transfer of firearms and ammunition, according to the RCMP press release. Anderson alleges the search, executed Wednesday, turned up a prohibited gun magazine. A magazine is an attachment to a gun which holds rounds a gun will fire. In Canada, semiautomatic rifles are limited to five cartridges. Semiautomatic handguns are limited to 10 cartridges. "These magazines hold what looks like 30 rounds," said Anderson. "They have rivets which allow only five at a time, but if you tamper with it, it can allow you to access all the rounds, whatever the size is." Chris McCray, the brother of Ralph McCray, told CBC News the police operation was "way over the top" for what he said was an "honest mistake" over checking for identification. Miramichi City Surplus shares a link to the Miramichi Sportsmens Club on its website. Club president Morrill Sisk, said he wasn’t aware of any problems at the store. "I'm kind of surprised. I didn't hear anything about a raid,” said Sisk. "You can take a 10 or 20-round magazine and modify it for five — which is common. You can get a gunsmith to modify it so it still has the same look," he said. "We certainly don't foster the use of illegal guns at the range." A gun photographed strapped to Justin Bourque, 24, who stands accused of killing three RCMP officers and attempting to murder two others in a June 4 shooting in Moncton, appeared to have a large-capacity magazine clipped to it. Anderson said this case is not related. McCray, Trepanier and Richard are scheduled to appear in court again August 25.